Simon directing a commercial in Belgium. Simon Hunter was born in 1969; he made his first film at seven year old. ‘Spaceman’ starring his parents and his dog, the 3 minute film told the story of a spaceman flying down to earth and reeking havoc on a remote cottage in the Scottish Highlands. Simon went on to make nearly fifty short films, whilst growing up in Dumfrieshire, Scotland. At the age of eighteen he backpacked off to Central Africa and shot a documentary. The twelve-minute film "Zaire, an African River Journey" charted the progress of the hundreds of people that plow up and down the Congo River each month. The film won Simon a place at film school. At film school Hunter won several awards for his graduation film ‘CLICK" which tells the harrowing tale of a cleaner who gets their hand stuck in a waste disposal unit and has to be rescued. Simon then signed with Infinity Productions in London and shortly afterwards completed his first commercial, a clever take on Sony Playstation’s ‘Double Life’ for The Lothian Health Board. Entitled ‘Power of Experience’ it was conceived by The Union Advertising Agency in Edinburgh. At the Cannes advertising festival in 2001 Simon’s movie ‘Lighthouse’ attracted the eye of Bob Isherwood, the creative director of Saatchi and Saatchi. Isherwood selected Hunter for the New Directors Showcase. This prestigious honour is awarded to the twenty-five most promising directors in the world. Isherwood admired Lighthouse, saying, "few films demonstrate so clearly how tension gets attention. The tension is dynamic". Simon spent four days shooting the mood film almost all against blue screen. Nearly five months of post production followed. The entirely film was shot with out the use of any facility house and the effects were completed together with the grading at an edit facility that Simon housed in his garden in London. Simon spent the next few months screening the teaser all over Hollywood. In the spring of 2006 the financing of Mutant chronicles began. The production process would involve nearly 2000 visual effects shots, a British record and take nearly two years to complete. By the end of 2007 Simon had worked on Mutant for almost three years. In 2016 Simon completed his third feature film, his passion project, EDIE which tells the tale of an old lady who heads to Scotland to climb a mountain. The movie stars Sheila Hancock and Kevin Guthrie. The movie was selected for the Edinburgh International Film Festival in June 2016. The movies has subsequently played in film festivals around the world, including Santa Barbara, Dublin, Victoria and HOF. The film earned a wide cinematic release in the UK on MAY 25 showing on over 100 screens in the UK. The film will open theatrically in the United States in Summer 2019. Simon loves traveling lightly ideally with just rucksack and tent, you can read about some his treks on SIMON'S BLOG. 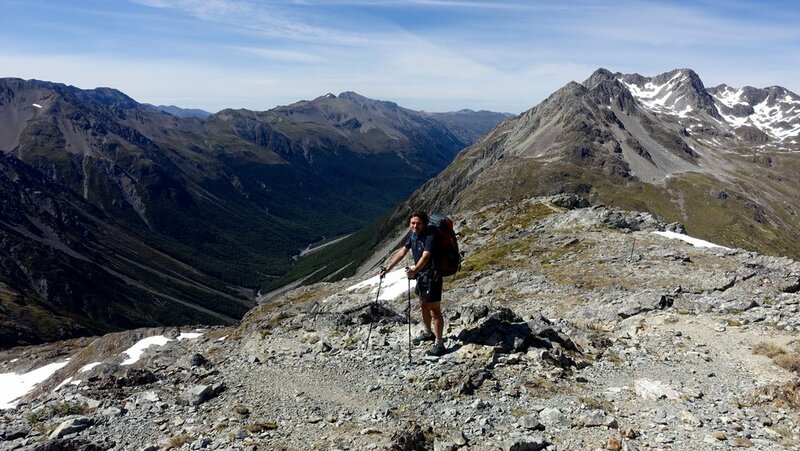 In 2017 Simon spent 4 months trekking across the whole of New Zealand on the Te Araroa trail in New Zealand, which Simon says was the most amazing experience of his life. Simon is represented by the United Talent Agency in Los Angeles and at 42mp in London. Please see the commercials page for details of his adverting representation. An recent interview with Simon Hunter at the Cleveland International film festival. …and here are some of Simon's latest photo's ... out and about.